If you follow me in on Instagram, you have probably seen that I am pro hashtag eat the rainbow. The more variety of color we get from fruits and vegetables, the more antioxidants, phytochemicals, vitamins, and minerals we are getting into our bodies. The more of these, the better. 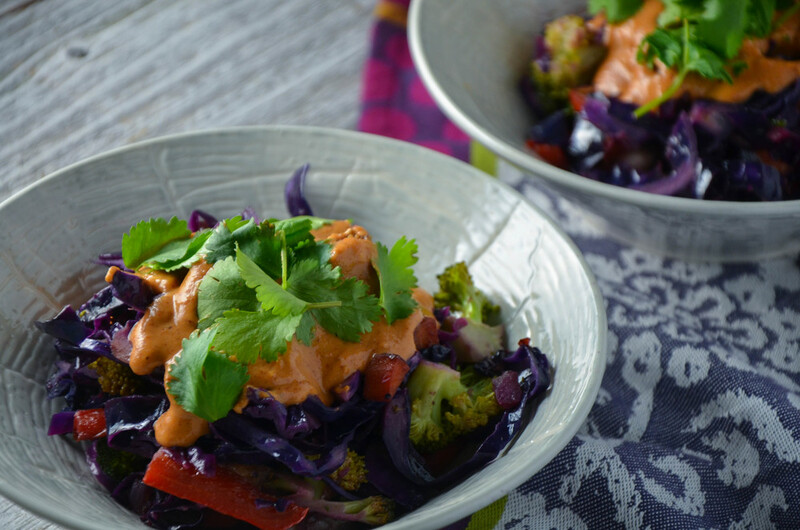 This recipe is a great way to get in tons of colorful vegetables into your diet. You don't need to use the same ones I used in mine, either; if you have some veggies in your crisper that are on the verge of losing their crisp, this is a great solution to prevent them from going into the trash (I know we've all been there!). I went an Asian direction with this dish, using sesame oil to cook the vegetables, and making a spicy, tangy almond butter & sriracha sauce to throw on top. Super easy and so delicious. For added protein, you can put an egg on top, mix some beans in, or even eat this as a side with fish or chicken. Heat a large pan or cast iron skillet over medium heat, and add sesame oil. Add onions and cook 3-4 minutes until translucent. Add the carrots, peppers, and broccoli and continue to sauté until they reach your desired consistency. Throw in the cabbage and lemon juice and stir until everything is mixed evenly. Stir in the cilantro last and remove from heat. At some point while the veggies are cooking you can make your sauce. Whisk or mix together the almond butter, sriracha, tamari, garlic, apple cider vinegar, and lemon juice until evenly combined. Add water to thin. If you like a more liquid type dressing, add more. Taste and adjust ingredients as needed. Portion your vegetable mixture into bowls or onto a plate, and drizzle sauce on top. Alternatively you can mix the sauce up with the vegetables in the pan. Serve with your choice of protein and top with some cilantro for garnish and enjoy! What is your favorite way of incorporating a variety of vegetables into your diet?